We are at the end of March which is Women’s History Month, but also the month that has International Women’s Day and National Puppy Day. Both of these days and Women’s History Month were my theme of work and reading. At the end of February on a very long drive up to Minnesota, I listened to a BBC podcast that talked about a woman named Mary Anning. I am embarrassed to say I had never heard of this woman, but I quickly found out why. 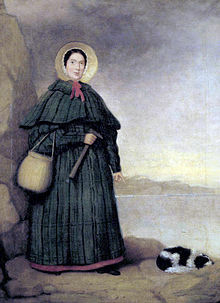 Mary Anning was a fossil hunter during the 1800s when it seemed the world was at this weird peak of fossil fever. Her family resided in Lyme Regis of Great Britain and lived close to the cliff that she wandered looking for fossils during her life. Everyone was curious about these fossils that were being found all over the world (often referred to as “curiosities” or “curies”), but we were also at a time where science and the idea of evolution were still very new and quickly rejected by many people who were more comfortable with the idea of divine creation. It was an idea that was viewed as blasphemous by the church because it put into question the Bible and the existence of God. It also suggested that if God did exist, he was imperfect. Mary and her brother Joseph started fossil hunting at a very young age with their father, Richard, who was also a cabinet maker. He passed when Mary was young leaving the family in significant debt. During this time, many citizens of Lyme Regis went fossil hunting to supplement their incomes by selling “curies” (fossils) to tourists. The Annings were one of these families, but Mary was particularly good at finding and identifying fossils. 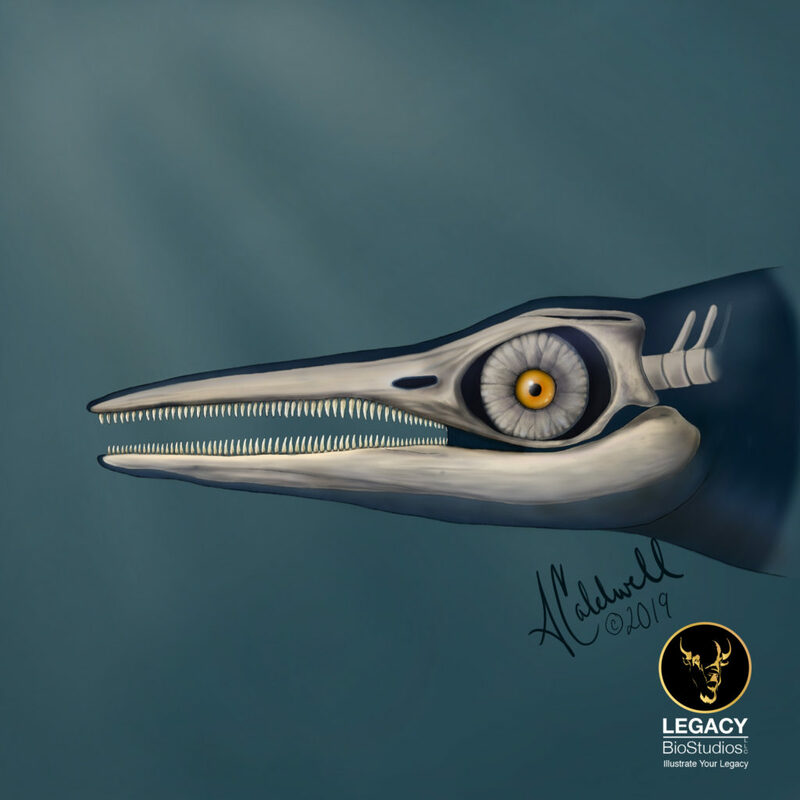 Around the age of 10, Mary and her brother Joseph found a new specimen, an ichthyosaur! It was a year-long endeavor, first with Joseph finding the skull and Mary later finding the rest of the body. This finding was one of the first of many contributions to the world of science from the Anning family. Later Mary found other ichthyosaurs and also provided the research that identified coprolite. Mary’s discovery of the plesiosaur was particularly earth-shattering because its anatomy challenged the way reptiles were defined. Reptiles were known to have eight cervical vertebrae, and this new creature had closer to 40! Big difference, right? So thought the famous zoology anatomist of the time, Georges Cuvier. He went so far as to claim the discovery was a hoax and Mary had fabricated the specimen. But thankfully, Cuvier was proven wrong, and Mary’s credibility was preserved. Later, Mary went on to discover many more species, including the first found pterosaur! Mary did all of this without being traditionally educated. She learned everything about fossils on her own with the help of access to scientific articles given to her by fellow paleontologists and geologists. So many discoveries, but no name. While Mary discovered and dug out these new specimens and many had the PRIVILEGE to work with Mary, Mary’s name was forgotten through history. 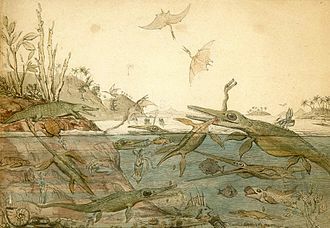 Mary worked with the likes of Henry De La Beche, a geologist and the artist of Duria Antiquior where he depicted an ecosystem featuring Mary’s creatures. She worked with William Buckland and collected, dissected, and theorized that what they were digging through was actually fossilized feces, later named coprolite. She and a fellow fossil hunter, Elizabeth Philpot, even found a belemnite with ink sacs intact that many artists were able to actually, USE THE INK to create illustrations! Many people wrote papers on Mary’s ichthyosaurs and plesiosaurs such as Everard Home, William Conybear, and Richard Owen. These are all names I recognize and learned about in my comparative anatomy and evolution classes because these men were given credit for Mary’s discoveries and the right to name Mary’s findings. Mary’s contributions were overlooked, rarely documented if ever mentioned, and eventually, she was forgotten altogether. After starting my research on Mary Anning, my husband surprised me with a gift. He bought me a copy of Remarkable Creatures by Tracy Chevalier. Chevalier brings to light not just some of the facts about Mary Anning’s discoveries, but rather what that meant at the time, as a woman. Of course, this book is a work of fiction, but I can imagine that it is true to the era and its treatment of women, science and its general rejection of women in science. The story follows the lives of the Annings, highlighting Mary; and the Philpot sisters, highlighting Elizabeth, and the friendship that bloomed between Mary and Elizabeth because of their mutual love of fossils and fossil hunting. As the book progresses, Chevalier elaborates on actual events such as the death of Richard Anning, Mary’s father, and how his crippling debt affected his surviving family. It also describes instances when the more affluent community members used Mary to add to their collections which would eventually end up in the hands of museums and scientists without even mentioning Mary’s name. Often them taking the credit themselves. I will admit, at times I became so frustrated by the events that arose, that I had to stop reading for a while. The way women are talked about by the men is as though they are second class citizens, and Mary’s skills were considered something “divine” because no “normal” woman would be able to search and deduct they way Mary could. While the book swirls with drama, it also brings to light how dangerous Mary’s job was. In truth, Mary almost died many times due to mudslides on the cliffs, and unfortunately, that was how she lost her dog, Tray. Nevertheless, she persisted. Lastly, Chevalier’s novel brings up the underlying theme which is the battle between science religion. The new idea of evolution is, and with that, the character embodiment of the church’s beliefs is Reverand Jones who throughout the book tells his congregation Mary’s findings are a test of faith from God. I enjoyed this book, and I highly recommend it. I felt the story did an excellent deep dive into what the real Mary Anning and Elizabeth Philpot probably had to deal with during their lives and how they felt about it. You get to see strong women deal with their problems during that time and while it got frustrating and at times, upsetting, it was also sincerely inspiring! Mary passed away at the age of 47 due to breast cancer, but before her death, Mary was named an honorary member to the Dorset County Museum, and upon her death, Mary’s eulogy was written and read by Henry de la Beche to the Geological Society, something only done for members. Three years later, the Geological Society dedicated a stained glass window to St. Micheal’s Church in her honor as a sign of respect and thank you. Most recently, in 2010 Mary was named on a list of most influential women in the history of science by the Royal Society. Lastly, while during her life Mary never had the opportunity to write any papers, or name any species herself, she has had many species named after her in her honor. Mary had a very loyal dog named Tray who walked the cliffs with her every day until he passed in a tragic landslide. When I learned about Tray, I couldn’t help but feel grateful to every dog that ever walked, sat, and napped loyally by me. I am especially thankful to the BioStudios office pup, Mya. I know her job is not nearly as dangerous as Tray’s, but she is still a dependable companion that’s here with me every step of the way. So, Happy Belated National Puppy Day and give your pups a squeeze and a treat! I know Mary Anning’s story isn’t unique. I have been genuinely inspired by Mary Anning this month, and her story has pushed me to keep striving in the work I want to do and keep working hard even when things start to seem a little less possible. I have also been sharing her story with everyone I have met in hopes of inspiring others. History has left many strong and influential women out the textbooks, and we may never know their names, but, we do know they were there and we see their impact, and that pushes the women of today. We are strong, we are contributing, we are making an impact, and yes, we are women. So thank the strong women in your life, and make sure to remember them and credit them and if you are that woman, don’t be afraid to speak up and take your credit. We can’t be forgotten, because who is to say the work we do now won’t inspire another young woman to pursue their interests in STEAM. 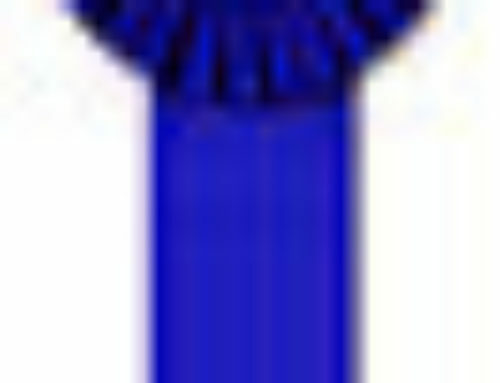 The post Women’s History Month – Remembering Mary Anning appeared first on LEGACY BioStudios, LLC.